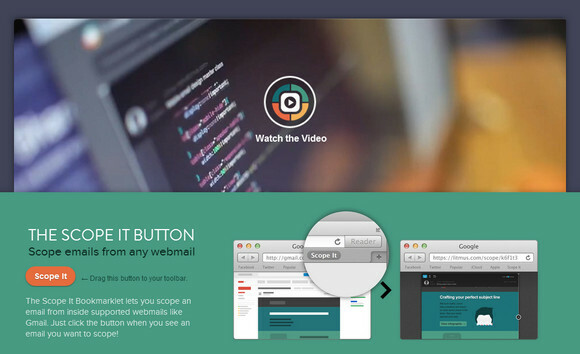 Litmus Scope helps you create a clean, web-based version of any email, with desktop and mobile previews. It’s perfect for sharing, and it’s totally free. Beautifully display the desktop view alongside an actual mobile screenshot. You can also peek behind the curtain and see how they pulled off that cool video or fancy text. Scope’s sleek code inspector makes viewing email source code a breeze. They even decode and clean up the HTML, making it crystal clear. 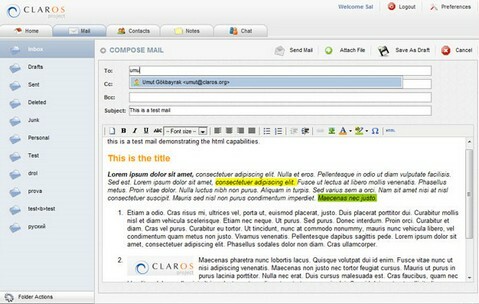 The Scope It Bookmarklet lets you scope an email from inside supported webmails like Gmail. For too long HTML email has been the ugly step-child of the web. It’s time for a change, so Campaign Monitor teamed up with some seriously talented designers to bring their skills to the world of HTML email. 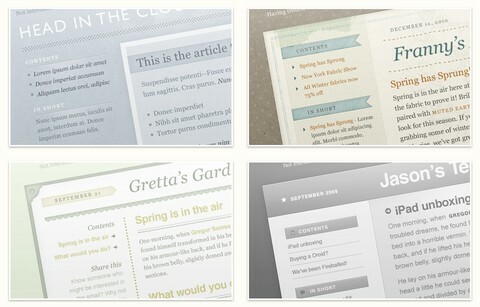 There are 100+ Free HTML Email Templates with PSD source files. Every template has been thoroughly tested in more than 20 of the most popular email clients like Outlook 2010, Gmail, Lotus Notes, Apple Mail, the iPhone, and more. They’re ready to roll and are completely free. A central principle behind Raindrop is that messaging should be personal — they want Raindrop to be people-centric both in how they process messages, and in how they can help give people control over their personal data and experiences. When a friend’s link from YouTube or flickr arrives, your messaging client should be able to show the video or photos near or as part of the message, rather than rudely kicking you over to a separate browser tab. Notifications from computers and mailing lists should be organized for you, not clutter your Inbox or require tedious manual filter setup. It should be easy to smoothly integrate new web services into your conversation viewer entirely using open web technologies. Remember we have mentioned AtMail 5 long time ago. Recently, they have launched a new version of Atmail as a complete Webmail, Mail-server and CalDAV server for ISPs/Webhosting providers and Small-business. 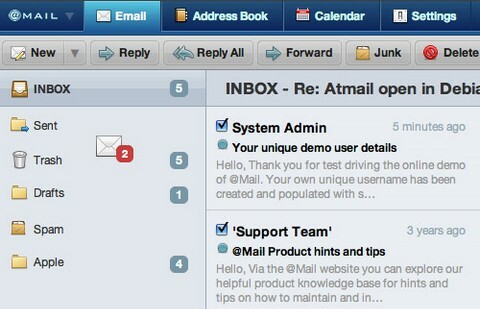 AtMail 6 is a Linux based Webmail Client + Email solution which brings your organizations email under control. AtMail 6 has been completely rebuilt from the ground up using Zend, jQuery, a true Web2.0 interface, Gmail email threading, inline attachment thumbnails, full IMAP/S support, CalDAV client/server – The aim is to provide users an alternative to Gmail or Exchange running on your own networks. It’s faster, lighter and more logical. The new version of AtMail really impressed me. It is very powerful and easy to use. The new user interface is absolutely stunning. They do offer a Free 5-user license of AtMail for us to download and install as well. This license includes all the features available in the commercial Atmail version. P.S. If you love AtMail, you might consider purchasing premium licenses. AtMail is very kind to offer us 20% discount off for any purchase. 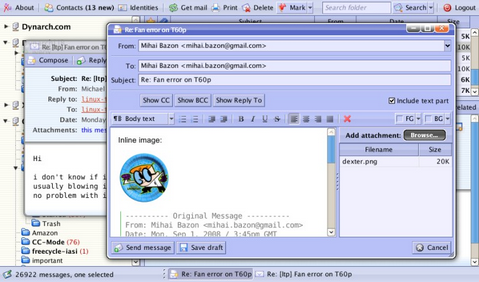 Xuheki is a fast IMAP client which aims to become your preferred email client. It works in your browser and you can access it from anywhere to read your email. The interface is similar to a desktop-based email client and it’s completely “AJAX”—no page reloads. 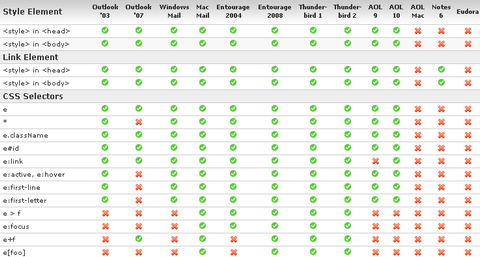 It is designed with IMAP in mind. This has a downside—we don’t support POP3, nor other protocols, but the big advantage is that it makes use of certain IMAP features which allows it to be very efficient. It supports multiple folders; you can also create/remove folders from a convenient context menu. You can move messages to various folders using drag’n’drop. The interface is designed to allow you to do multiple things at once. For example you are reading an email, then click “reply”. While you’re writing your reply, there’s an incoming mail. You can simply minimize the composer and to check the new message. You can compose multiple messages at once. The UI is driven by dialog boxes. It has a basic address book and autocompletion of addresses in composer. Of course, it supports multiple users on the same installation. Xuheki is distributed under the terms of the GNU General Public License. Zenbe is started because they wanted the functionality and performance of a desktop application, and the simplicity and accessibility of webmail, at the same time, for all their email addresses. They wanted to access more features and services from the internet, without logging into a bunch of different websites everyday. They wanted better ways to share and work with friends, but they didn’t want to abandon email to use them. Zenbe is free email that works with the email you already use. Zenbe offers many features, including email, online calendar, lists, mobile sync, file sharing, team collaboration. It even works with Facebook and Twitter. You can do them all without leaving your email. With 4GB (and growing) of storage, you treat Zenbe like a computer you can access from anywhere. Sometimes, email just isn’t the best way to work together. 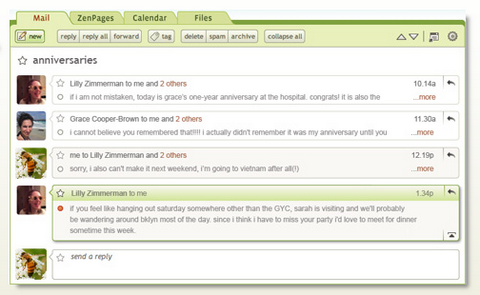 With Zenpages, you can share files, email, events – anything you would share in an email – on a Zenpage. If you like to stay organized with folders, you will love Zenbe’s email tags. Tags are like folders, but better. But with Zenbe’s excellent search, you don’t need to use tags to stay focused on what you care about. Zenbe is one of the best webmail experiences you can find. Their mission is to drive the use and support of web standards in email, working with email client developers to ensure that emails render consistently. This is a community effort to improve the email experience for designers and readers, and they’d love your help. They would like to help web designers understand why web standards matter for email, so that they are willing to get involved in making it happen. And also, they are providing as much assistance and feedback to the email client developers as they can. You can see the beginnings of this with their email acid test results. When it comes time to design emails though, do all the same rules apply? Are there things we should be doing specifically for email that don’t make sense on a website? Campaign Monitor has published an article of 2008 Email Design Guidelines that shows us the technical, design and information elements that make up a successful HTML email.